Today we’re going to go over an article from the journal Food Chemistry that came out in 2006 called “Low temperature brewing using cells immobilized on brewer’s spent grains” by Nikolaos Kopsahelis, Maria Kanellaki and Argyro Bekatorou. As some of you may have heard, there is a new technology dawning in the brewing world that even started trickling down even to the homebrewing level. I am talking about immobilized yeast. Some of you may have heard of a group giving away magic beads that will ferment your wort without having to deal with suspended yeast for homebrewer feedback. I contacted the group and they seemed happy to give me a sample to try and write a feedback on my blog, but suddenly disappeared and didn’t answer my emails anymore while giving out samples to others. In any case, as far as I know, the results are predictable – quick and clean fermentation, but the end product lacks the complexity of normal ale fermentation. This may seem like awesome new tech, but it actually goes back to the 1970s when scientists first tried to create these for ethanol production and wine making. Brewing industry quickly picked up on that and have been looking into possibility of using this technology to lower proaction costs. The original cell immobilization was done by S. Humphreys’ group in 1976 and they utilized metal hydroxides as the carrying matrix for immobilized cells. In 1992, a group from Greece under A. Koutinas isolated a strain of S. cerevisiae from a grape that was not only alcohol resistant, but also psychrotolerant (grows best at low temperature) and did not create unpleasant off-flavors during fermentation, making it an interesting candidate for wine and beer production. It became known as AXAZ-1 strain. By that time, it became apparent that metal based matrix is not ideal for cell immobilization and scientists started experimenting with organic materials, particularly those rich in cellulose. With recycling becoming more and more popular, beer scientists started looking at best ways to utilize the spent grain. Spent grain leftover from the mashing process is the largest byproduct of beer making process and provides a matrix rich in cellulose, protein and starch. It became quickly apparent that yeast can be easily immobilized on spent grain and the resulting mix was effective in fermenting wort. Most of the research focused on refining and optimizing this process was done in Greece, but with the financial crisis that has mostly ruined Greek economy, I’m afraid the progress has been delayed by at least a few years. 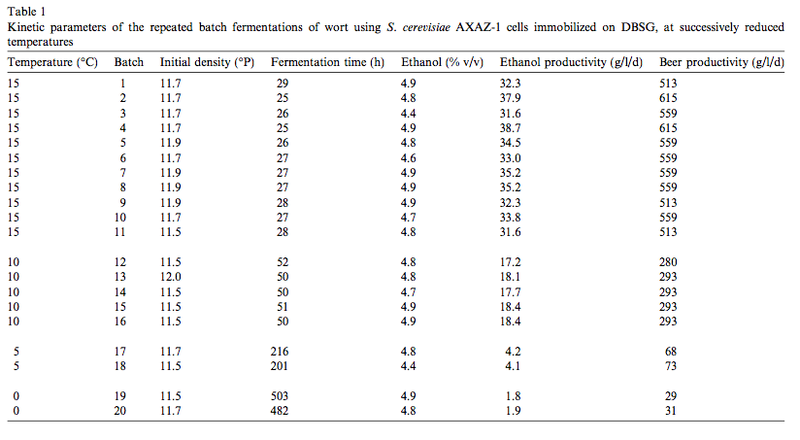 The following article looks at fermentation properties of AXAZ-1 immobilized on spent grain. Overall the article is technical and concentrates on analysis aspects, but I’ll try to sum it up in general terms. As before, I claim no authorship of any of these studies and credit goes to the scientists who tirelessly worked on creating this paper. Use of immobilized cells has been studies for well over three decades with main goals being facilitation of continuous processing, shortening maturation time and production cost reduction. This process has already been used for commercial production of low alcohol beers as well as secondary fermentation. There are, however, several aspects to this that require improvement in order to become commercially valuable, not the least of which is consumer fears of new technologies. Others include quality of such yeast, preparation costs, handling and regeneration, consistent fermentation characteristics, dealing with contamination and maintenance of these cultures within the brewery. One way of improving on some of these issues would be optimization of the carrying matrix on which the cells are immobilized. Researchers have used various food grade supports such as gluten pellets, processed cellulotic materials and even fruits, resulting in beers with good taste and aromas even when fermented at very low temperatures of 0-5˚C (32-41˚F). When selecting a good carrying matrix, one also has to consider availability and the ease with which it’s made. With recycling becoming more fashionable every day, researchers turned their sights on the spent grain. As the biggest brewing byproduct, it is something breweries are never short of, making it a very easily accessible material. Moreover, it is a material rich in fiber, proteins and lipids that is also 100% compatible with beer production. Spent grains have already been utilized as protein rich animal feed and mushroom growing substrate. European Social Fund funded efforts to upgrade spent grain usage in beer and alcohol fermentation, serving as a fermentation biocatalyst based on cell immobilization. Combining spent grain and cold-loving yeast, therefore, presented an interesting possibility, which was investigated in this paper. 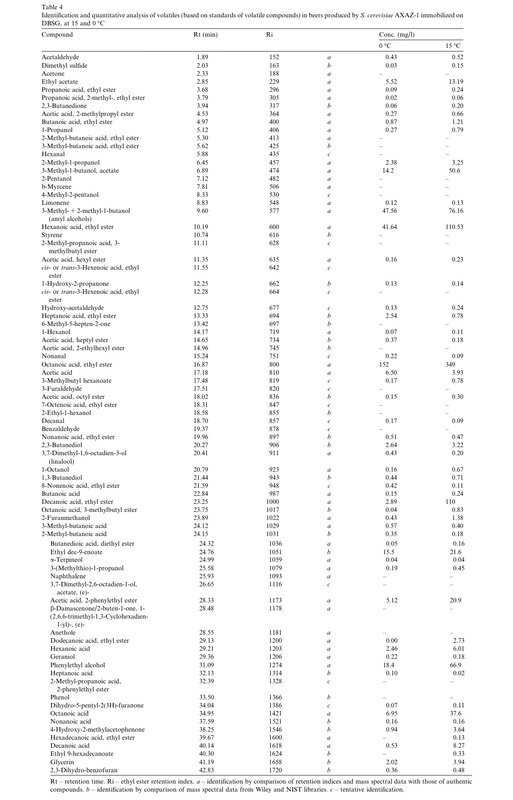 Methods: I omitted most of the technical stuff that would be of no interest to homebrewers. – Preparation of the support and immobilization of cells: Spent grains were delignified (removal of lignin which gives plants their rigidity and woodiness) by boiling in 1% solution of NaOH for 3 hours. Delignified Brewer Spent Grains (DBSG) were then washed with water, drained and sterilized by autoclaving. Yeast was immobilized on the grain by suspending AXAZ-1 cells in 12% glucose synthetic medium and DBSG were mixed into that solution. CO2 produced during fermentation was sufficient enough to gently mix the grain. Fermentation was allowed to progress for 6-8 hours until all sugar has been consumed. The remaining liquid was decanted and the grain (with yeast cells now stuck to it) was washed twice with fresh glucose medium and used for brewing experiments. – Fermentation: Biocatalyst and 1.048 SG wort were mixed in ratio of 1:2 weight:volume and fermented at 15˚C (59˚F) to adapt cells to wort. Following fermentations were carried out with successive temperature reductions to 10, 5 and 0˚C (50, 41 and 32˚F). At the end of each fermentation, the biocatalyst was washed with fresh wort and used to ferment the next batch for a total of 10 consecutive small batches (650mL). Green beers were immediately collected and analyzed for ethanol, residual sugar, free cells, diketones, dimethyl sulfide (DMS), bitterness, color and volatiles. Green beers were tasted by 10 non-trained people in accordance to taste test protocol, as well as by an industry trained taster from the Athenian Brewery. 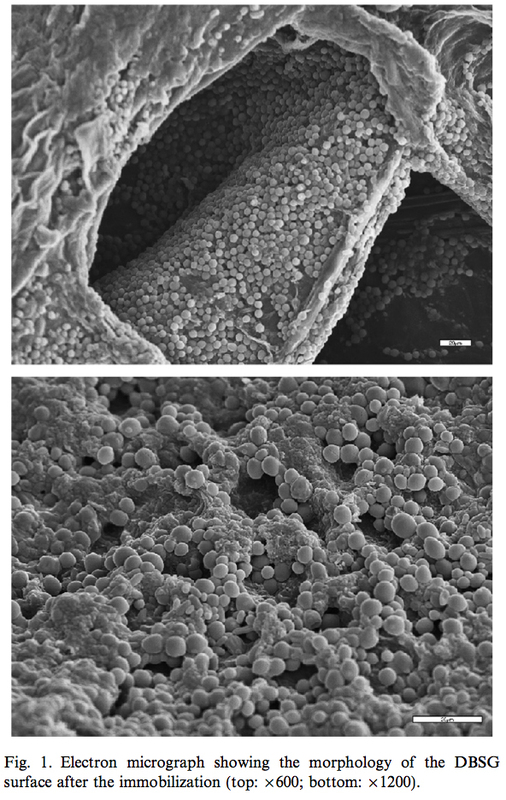 – Fermentation: Attachment of yeast cells to DBSG was confirmed by electron microscopy (Figure 1). 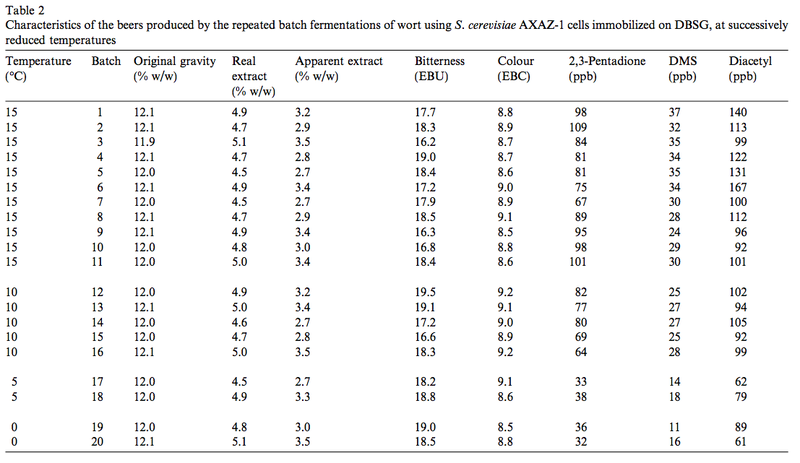 Immobilized S. cerevisiae AXAZ-1 cells were effective at fermenting wort even at very low temperatures ranging from 0 to 5˚C (32 to 41˚F). Fermentation kinetics and routine industrial analyses of resulting beers are shown in Tables 1 and 2. Immobilized cells retained their stability from batch to batch even at very low temperatures and finished fermentation in times ranging from 1 day at 15˚C (59˚F) to 20 at 0˚C (32˚F). At all temperatures the fermentations reached terminal gravity and resulting alcohol levels ranged from 4.4 to 4.9% by volume, showing the effectiveness of this method in low temperature alcohol production. Beer productivities (29–615 g/l/d), and ethanol productivities (1.8–38.7 g/l/d) were high, and proportional to the temperature. The final free cell concentrations were low (0.4–1.6 g/l) and the beers had a fine clarity after the end of primary fermentation. Diacetyl and 2,3-pentadione are fermentation byproducts responsible for butterscotch/toffee off-flavors in beer at concentrations above 0.5 mg/L, and lagers require a thorough diacetyl rest to reduce the concentration of these compounds after primary fermentation, which requires high storage capacity, cooling and high energy expenditure. Concentrations of these compounds were measured for each of the DBSG-immobilized beers. At all studied temperatures, the diacetyl and 2,3-pentadione concentrations in the green beers were to low (61–167 ppb and 32–109 ppb, respectively), decreasing with fermentation temperature (Table 2 and Fig. 2). At 0– 5 °C, the 2,3-pentadione content was about threefold lower than that at 15 °C, and at levels similar to those found in mature commercial products (about 30 ppb). Diacetyl in beers produced at 0–5 °C was about half that at 15 °C, which is about double the levels of commercial products (about 30 ppb), but within acceptable levels (<1 ppm). Dimethyl sulfide (DMS) comes form a malt-derived compound that gets into the wort and gets processed by the yeast during fermentation. It has a very low taste threshold of around 33 ppb and is the primary contributor to the “lager” taste in beer. However, after it reaches a certain concentration, DMS contributes the “cooked veritable” flavors which aren’t so sought after by brewers. 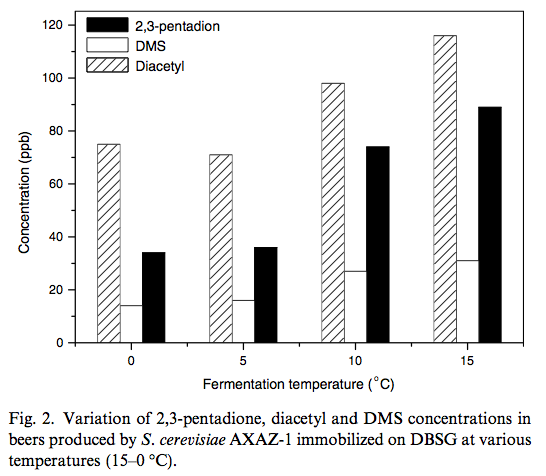 In the beers produced with DBSG-immobilized yeast, DMS concentrations varied from 11 to 37 ppm, which is lower than that of most matured commercial lagers (< 40 ppb) and matured beers in general (14-205 ppb). Not surprisingly, DMS concentration was reduces with lower fermentation temperatures and at 0˚C it was three times lower than at 15˚C (Table 2 and Figure 2). Fermentation temperatures did not affect bitterness levels (Table 2). 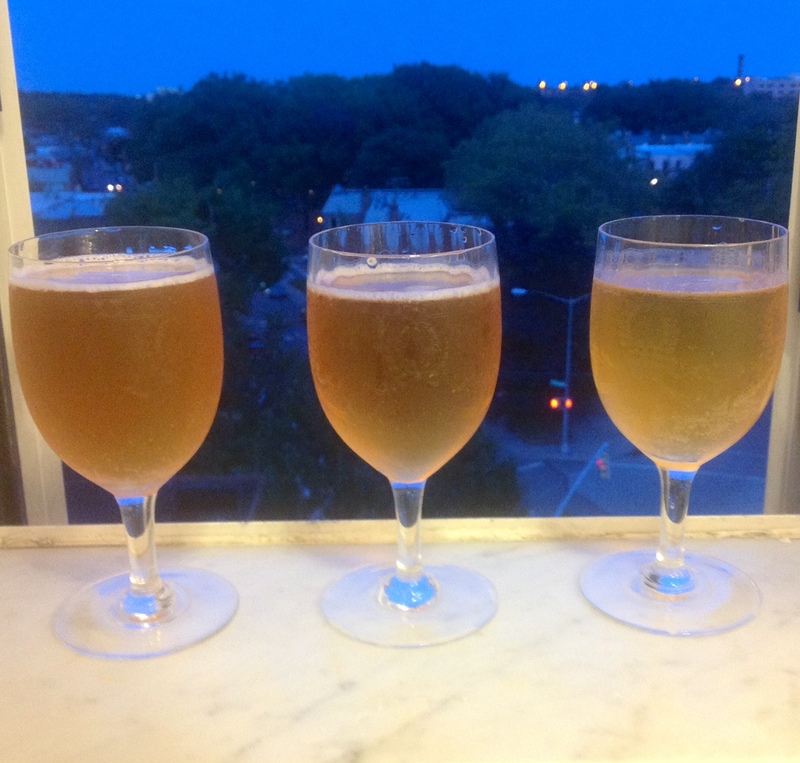 Clarity of the beers after primary fermentation was fine and color values matched those of most commercial products. – Volatiles Analysis: Volatiles were analyzed by gas chromatography (something that’s way, way, WAY out of homebrewers’ or even of commercial breweries’ league). It was found that the total higher alcohol content in the experimental beers was lower than that found in mature commercial products and was reduced as the fermentation temperature decreased. Specifically, 1-propanol, isobutanol and amyl alcohols at 0 °C were reduced by about 41%, 33% and 30%, respectively, compared to those in beers produced at 15°C (Fig. 3). 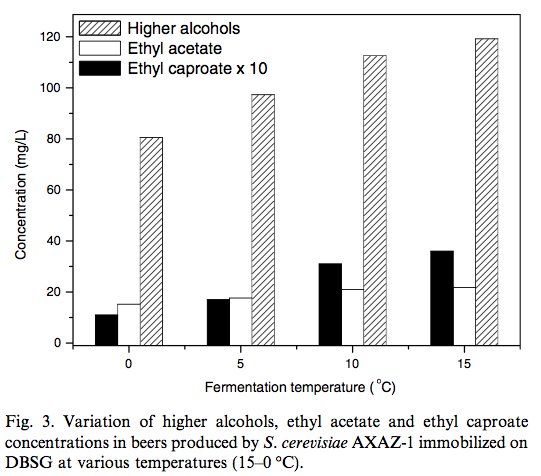 Ethyl acetate concentration was reduced by 30% in 0˚C beers compared to 15˚C. Interestingly, the ratio of higher alcohols and esters remained practically the same at all fermentation temperatures. This means that while higher alcohols’ concentration decreased, so did the fruity ester content. Interestingly, isoamyl acetate (banana-like character) and ethyl caproate (wine-like and fruity character) production was the same between 5 and 15˚C fermentations, but decreased by ~50% when fermentation was carried out below 5˚C. Both were within desired concentration (0.12-0.67 mg/L and 0.07-0.42 mg/L, respectively) and considerably below the “too much” threshold. 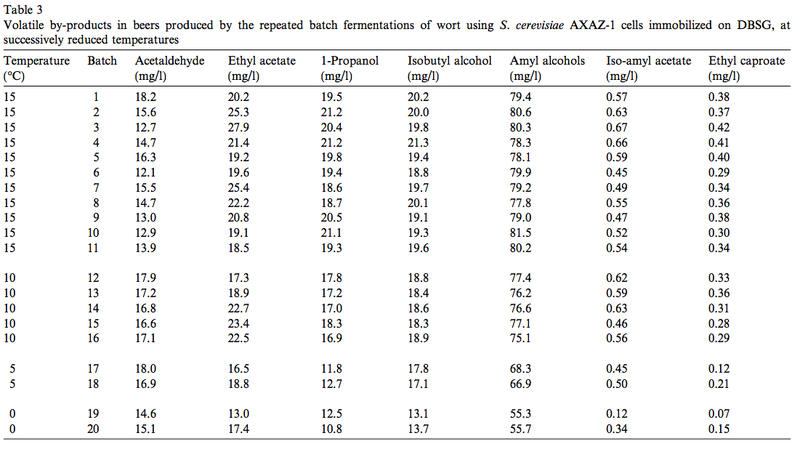 Acetaldehyde concentrations were stable in green beers at all fermentation temperatures (12.1-18.2 mg/l), which are higher than those found in mature commercial beers (~5 mg/L). The group went on to analyze 80 more volatile compounds that are produced during fermentation and influence character of the resulting beer due to their low threshold (Table 4). Most of the identified compounds were esters (mainly ethyl esters of fatty acids and acetic esters of higher alcohols), which are usually found in most beers. The amount of total volatiles was higher in beers produced at 15 °C, indicating higher metabolic activity of the yeast and/or increased chemical transformations at warmer temperature. Miscellaneous compounds, that have relatively low threshold values and usually affect beer flavor with either their fruity, floral or caramel flavors, such as b-myrcene, limonene, linalool, b-damascenone, a-terpineol, anethole, geraniol, phenylethyl alcohol, 3-furaldehyde, 2-furanmethanol, dihydro-5-pentyl-2(3H)-furanone and 4-hydroxy-2-methyl-acetophenone, were also identified. Their amounts were about the same or slightly higher in beers produced at 15 °C, except phenylethyl alcohol and 4-hydroxy-2-methylacetophenone, whose amounts were considerably higher at 15 °C. Off-flavor compounds, such as hexanal (green-leaves odor) and 3-(methylthio)-1-propanol (rotten eggs) were detected in traces in both samples. The sulphur compounds 3-(methylthio)-1-propanol and DMS were found in higher amounts in beers produced at 15 °C. Some compounds such as acetic acid, 8-Nonenoic acid and nonanal were at higher concentration in beers fermented at 0˚C. These results demonstrate that DBSG is an interesting potential cell immobilization substrate for use in brewing and alcohol production industries. It meets the prerequisites for a cost effective industrial application, it is readily available, fully compatible with beer and is of food grade purity from the start. High fiber content gives the grain enough resistivity to stay intact during fermentation. Using cold-loving strain of yeast allowed significant reduction of fermentation time even at very low temperature. Interestingly, young beers fermented at 0-5˚C were characterized by tasters as better, with fine flavor and mature character. This is possibly due to lower concentrations of higher alcohols, diacetyl and DMS as well as reduced content of other volatiles. Tables 3 and 4 show that there is a strong impact of temperature on aroma compound production, though immobilization itself doesn’t affect these processes compared to free cell fermentation as been shown previously in other publication. Fine clarity of the beer right after primary fermentation combined with low vicinal diketone concentrations may possibly lead to elimination of maturation stage, resulting in significant reduction of production time and cost. Overall I thought this was an interesting article describing a technology that we may soon see widely available even on homebrewing level. What it comes down to is basically keeping the yeast from freely floating around as the beer ferments and instead keeping it as an easily separable mass within the fermentation vessel while relying on convection to ferment everything out. – The scientists grew yeast in glucose rich medium when getting them to stick to the processed grain before using that grain/yeast complex to ferment wort. This seems to be in direct conflict with the “indisputable homebrewer dogma” that yeast grown with simple sugars can’t ferment your beer well because they get used to processing only simple sugars. I thought about it now and again throughout my homebrewing life and could never really understand it. It isn’t like the genes that encode proteins necessary for breakdown of complex sugars go somewhere. This, of course, doesn’t mean that we should all make table sugar starters, but rather that it’s not such a dramatic effect that you beer won’t ferment out as some homebrew masters will swear to you while, I bet, they’ve never tried to do it themselves. I can see how the health of such culture would get affected due to fast waste buildup, but can’t see how fermentation capacity would be. – They used a 1:2 – BSG:Wort ratio for their fermentations. That, my friends, is a LOT of grain. For example, if someone is crazy enough to try and do it at home with a 5 gal batch, they’d need about 21 POUNDS of grains with yeast stuck to it. It would be wet and fully saturated so there wouldn’t be any absorption and it would be easily separable from the liquid, but that’s a lot of volume! – They fermented at temperatures as low as 32˚F! Yes indeed! And those beers apparently turned out really well with low “young lager” associated off flavors. This is very interesting in that this could really eliminate the lagering and diacetyl rest steps and thus save a lot of time and money. – Low temperature fermentations produce less esters and higher alcohols. That’s not surprising to anyone, but what’s interesting is that psychrotolerant yeast strains can ferment just fine at temperatures so low that even the lager strains stop, fall asleep and precipitate out of solution. In those conditions, ester and higher alcohol production decreases even more, which means the resulting beers would be very malt and hop forward due to very low flavor contributions of the yeast. Just imagine a beer that’s even cleaner than a pilsner! I don’t even know what that would be like, but I’d sure love to find out. – As with everything in life, there are two sides to this. One example of flaws associated with this method is high levels of acetaldehyde and some other off-flavor compounds that results from such super cold fermentations. That’s a serious concern, but I’m sure it’s only a matter of time before some other psychrotolerant Saccharomyces strain is discovered or even engineered that wouldn’t have these problems and we’ll have very clean and crisp almost-freeze-fermented lagers produced in just a few days. – This article isn’t the freshest in this line of research, but I chose it because it offered nice explanation of the process and examination of flavor compounds produced during fermentation. I’m sure progress has been made since then and I’ve seen a paper or two on the topic that were as late as 2012 I think. Problem with those papers is that they’re in journals I have no access to. Let me know if you’d like to know more about the topic and I’ll try to dig around and see if there is something interesting to be found. The time for another Cantillon Iris C3 yeast release has come at last! First, I’d like to apologize for such a delay in releasing it and feel like some explanation is owed. As you well know, I am working towards my PhD and time is not something I have a lot to spare. A couple weeks ago something magical happened – an experiment that I’ve been trying to get going since January suddenly started working (the secret was, as always, going with old school techniques that no one does anymore) and moreover, the results were interesting and as I predicted. Since then I’ve been very busy repeating the experiments and analyzing the resulting data. Since the procedure itself takes 4 days plus 5-7 or so days of analysis, you can guess that I don’t have very much spare time these days. Even the last Beer Science Literature Review post was done at a cost of staying up until 4am. I have had to work on weekends and this is the first one that I’m somewhat free so here is the next release of yeast! C3 has been described as pineapple, bubblegum, woody funkiness, citrus and mango. Ferments dry as do the other Iris strains. Some people had no pellicle (like me) while others had massive pellicles so I guess it depends on your beer. As always, use at your own risk and if the beer turns bad and/or poisonous, I have nothing to do with it. Email me at bkyeast@gmail.com if you would like a vial. $10 for shipping etc. If anyone wants to share the resulting beer, feel free to do so. So far only 2 people have done so and both beers were delicious. So don’t be shy! Beer Science Literature Review: Selecting and Generating Superior Yeasts for the Brewing Industry. Some time ago I surfed the net for some beer science articles, but left it off due to just being too busy. Then, a recent email exchange with one of my readers regarding yeast breeding and selection rekindled my interest in research in the field of brewing. Upon digging around through the ever-expanding databases of online research articles, I was pleasantly surprised by the amount of science that’s being done in malting, hop and yeast research all directly aimed at brewing. There are journals specifically dedicated to beer science. Some of them are freely accessible while others require subscriptions. Luckily, I can get my hands on most of them. Since reading even the free articles is not an easy task for those who don’t read scientific literature regularly, I hatched the following idea: I’m going to try reading a beer science article, digest it, and write a brief summary in every day terms for the benefit of the homebrewing community. I’m going to try to make it a regular thing if you, my readers, think it necessary and educational and I’m not just wasting my time and brain power. Since the conversation that sparked this idea was about yeast selection and breeding, we’re going to review an article on the state of yeast selection and engineering in the brewing industry. The following article was published in Cerevisia in 2012. Cerevisia provides a medium for the publication of both full-length articles and short communications on all aspects of malting and brewing, including biotechnology. The Journal will accept papers ranging from genetic or molecular biological aspects to those covering biochemical, chemical or bioprocess engineering aspects, provided that in each case the material is relevant to malting and brewing. The article is titled “Selecting and Generating Superior Yeasts for the Brewing Industry” and it’s by a group from Belgium. The tone is rather defensive and tries to convince the reader that genetically modified (GM) yeast is not from the devil, but is rather something that may become very useful and beneficial in the brewing world. That’s about enough introduction, so let’s jump straight into it! Fermentation has been utilized for food and beverage production for well over 8000 years, and had historically been spontaneous. Such processes resulted in inconsistent results and it was not until 19th century that using single pure yeast for fermentation became a viable idea. While this approach gave much more consistent results, producers now faced a new problem – selecting yeast strain that carried the desirable characteristics. Tools to do that were unavailable until just a few decades ago and so yeast used in breweries and wineries today have more historic rather than scientific reasons. With advent of molecular biology and genetics it has become possible to select or even make yeast strains with “custom tailored” traits. From the dawn of agriculture humans have been selectively breeding superior livestock and harvesting seed to use for planting resulting in an unnatural, but beneficial to us, evolution known as artificial selection. Its impact on the species subjected to it is very profound. Many modern crops yield harvests that are often over tenfold higher than their wild progenitors. Many such species, especially animals, have been selectively bred to an extent that they wouldn’t be able to survive in nature. One of the most striking examples is the Belgian Blue cattle that is so muscular that calves are too thick to pass through the birth channel and Caesarian section is required for every birth. Due to differences in size between microbes and cattle, their selective breeding is far behind compared to the latter. While people bred animals for about 10,000 years, it was not until 1680s that we even became aware of existence of microbes thanks to microscopy pioneer Antoni van Leeuwenhoek. It took yet another two centuries for people to even start thinking about involvement of microbes in food production as well as diseases. Louis Pasteur was the first person to show the correlation between various microbes and the corresponding flaws they contributed to wine. Even after it was established that yeast are responsible for characteristics of fermented products, selective breeding was impossible because, unlike cattle, you can’t you take two yeast cells and breed them. Advent of technology that would allow us to do that took place only a few years ago and is still not widely available. Genetic modification is a recent technique that has already found its way into improving microbes, crops and livestock. Without going into too much detail, genetic modification is very similar to selective breeding. A desired gene is inserted into the DNA of an organism and the resulting GM entity now carries it. Unlike selective breeding, though, the genes are not randomly recombined and genes are not restricted to those of species that can sexually reproduce. For example, cotton plants now carry a gene from a bacterium Bacillus thuringiensis, which produces a compound that’s lethal to parasites while being harmless to humans. This serves two purposes – higher yields of cotton and reduced pesticide use. 77% of soy, 26% of corn (which is by the way a product of millennia of selective breeding, original “corn” being about 2 inches in size) and 21% of canola worldwide are genetically modified. Fig. 1. Examples of experiments to improve industrially relevant phenotypes in yeast strains. 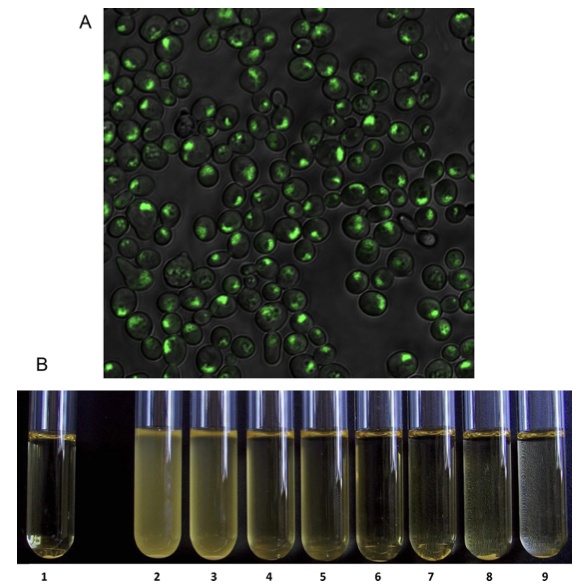 (A) Genetically modified yeasts in which one of the most important genes for aroma production is fused to a gene which codes for a green fluorescent protein (GFP). This way, the enzyme that accounts for the production of aroma compounds lights up green, so we are able to study its activity and localization in the cell. (B) Genetic modification of a yeast strain to fine-tune the level of flocculation. 1: control, 2–9: gradual increase of flocculation. In recent decades there was a rush to create genetically modified organisms for industrial applications which resulted in wonderful inventions like the transgenic safflower seeds that accounts for majority of world’s pro-insulin production and saves millions of diabetics worldwide. There were successes in the food industry, but food scandals, mad cow disease, coupled to ill-informed population resulted in their disappearance and they were eventually forgotten. Despite the initial defeats, GM organisms are slowly taking over and about 10% of crops worldwide are modified. In recent years several research teams have developed yeast strains that could potentially be very useful in brewing industry. There are now genetically modified strains of yeast that produce less diacetyl, that can ferment dextrins and starch, produce specific flavors etc, but brewers refuse to use them due to bad hype of GM organisms. These strains were often developed to meet specific industrial needs. Strains that can ferment dextrine and starch were developed for the purposes of creating low calorie beers because the resulting beers would have much less residual sugar. Despite commercial interest these beers were never commercialized due to pressure from protest groups and consumer fear of GM organisms. Food scandals and protests resulted in cessation of funding for development on GM bacteria and yeast for industrial and commercial use and the field dwindled to obscurity by late 90s. Very recently food industry started recognizing benefits of GM yeast once again. One of the latest victories for GM was patenting of a yeast strain in the US that is able to break down certain undesirable aroma compounds in wine with few winemakers already using it in North America. With increased interest, money once more started flowing into yeast development and research teams are now working on making strains to meet specific needs in beer, wine, chocolate, biofuel and other industries. There are already strains that produce various fruity compounds, ferment quickly, ferment completely, produce high or low levels of alcohol, flocculate more or less, able to survive in high alcohol, or even genetically tagged to be distinguished from other strains easily. Though no GM yeasts can be used industrially at this time, it is anticipated to change in coming years and some breweries are already showing interest in such strains. While we’re waiting for official permissions to use GM yeast, scientists are also working on selecting superior yeasts by means other than genetic modification. This is essentially done the same way it’s done with cattle, only on a much smaller scale. Individual yeast cells are picked, genetically screened to see what genes are up and down and thus determined which ones are better for this or other application, and are then crossed with other yeasts that possess some other desirable characteristics to result in an even more superior strain. Results of such breeding are already in use in our daily lives. Bakers can now choose yeast strains from a whole array of strains each with different characteristics and profiles such as fermentation speed, dough rising and temperature tolerance. Since these strains were developed by selective breeding, they are not GM organisms and can therefore be freely used. Paradoxically, the biggest roadblock on the road to using GM yeast in brewing is the beer itself. Since yeast contributes such a major portion of aroma and flavor to the beer, brewers are reluctant to change their house strain for something new. It may be somewhat ironic because the traditional brewing strains were mostly selected by trial and error based on the “whatever works better” criterion. That may be the case with old traditional breweries with many years of tradition and consistency behind them, but new breweries and new generation of brewers are less afraid of taking risks, experimenting and making scientifically informed decisions. There are already collaborations between researchers in Belgium and some Belgian breweries to perform large scale screenings to select and breed strains beneficial to brewing industry via non GM means. Some strains that were selected from such screenings are already in industrial use. This, of course is not only limited to beer and Saccharomyces. Other species of yeast that are of importance for food industry, for example chocolate production, are undergoing the same process. Yeast are grown in variety of different conditions and their industrially relevant characteristics in these conditions are mapped (Fig 2). Fig. 2. 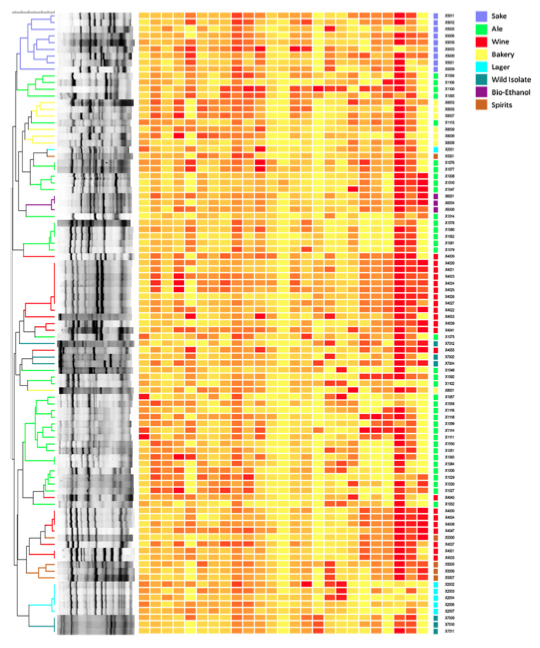 Graphical representation (heat map) of different characteristics of industrial yeast strains. Every row consists of data from a different yeast strain, every column is a different characteristic. “Yellow” is a low score, and “red” is a high score for this certain characteristic. The dendrogram on the left represents the genetic relatedness of the yeasts, based on an AFLP fingerprint exploiting transposon TY1 insertion site polymorphisms. The colour code on the top right indicates the origin of the yeast strains. This kind of analysis allows us to select yeasts with specific beneficial traits, for example to use in industry, or for breeding. With all these scientific advances in both genetic modification as well as selective microbial breeding, brewing and wine industry are still reluctant to try them. Other than government sanctions, tradition, bad publicity and consumer fears play important roles in preventing the use of “superior” microbes on industrial scale. While the GM taboo has almost completely disappeared in medical and agricultural fields, food industry has yet a long way to go. Should they adopt these new strains for the custom made ones? Benefits and dangers of using GM microbes in food are out of scope of that paper. When I said “there are groups working” on this or that throughout this article, those groups often include the one who wrote the original paper. The authors are the same people who actually generated and bred those strains of yeast that are talked about here. I couldn’t help but think of an article written by Derek at Bear Flavored Ales about the future of hops as I read and wrote this. He speculates that with all the new hop varieties that are becoming increasingly more fruity and specific in terms of which fruit character they impair we will soon see beers that taste like fruit beers without ever touching fruit. I believe that the combination of the new hop breeds and genetically modified yeast made so that they throw off high amounts of strawberry, or apple, or cherry, or pear, or watermelon, or apricot etc will indeed result in very fruity and interesting beers. I also believe it’s only a matter of time before GM yeast are finally approved for wide use and they will flood the market and brewing industry. Personally I support it and don’t see any zombie apocalypses or Frankenstein coming out of it based on what little I know on the topic, but it’s not my place to tell you if they’re good or bad. If you believe they’re bad and we should only stick to the original “wild” or “feral” strains, that’s perfectly fine and it’s been done for thousands of years with great success. While most old world and traditional breweries will probably choose to maintain their old cultures and stay true to the quality and traditional flavors particular to those breweries, I think new breweries (especially in USA and Belgium where tradition is good, but novelty is better) will most likely embrace these and give us a myriad of exciting new flavors. With advances in biology being what they are and an ever-growing number of scientifically educated brewers, I think we are standing at the very doorstep of a brewing revolution the likes of which were never seen in history. With increasing number of brewers embracing Brettanomyces, the yeast species that’s been selected against for as long as beer microbiology existed, and realizing what an amazing depth it can contribute to beer. With new hop breeds appearing every year, each with such an amazing and unique array of flavors and aromas. With increasing variety of malted grains at our disposal, some of which have been brought back from near extinction, adding to the malty complexity of the beverage we’re all so fond of. And now, with advances in biology being such that we can practically custom make yeast with properties that we want, I think just a couple decades from now we’ll think over a pint of “Lemon Garden With a Strawberry Twist Saison”, look back at this time and think how back in those days such beers were only a fantasy. I claim no authorship of all or any parts of the original paper. The original work was done by and belongs to Jan Steensels, Tim Snoek, Esther Meersman, Martina Picca Nicolino, Elham Aslankoohi, Joaquin F. Christiaens, Rita Gemayel, Wim Meert, Aaron M. New, Ksenia Pougach, Veerle Saels, Elisa van der Zande, Karin Voordeckers, and Kevin J. Verstrepen with all due credit and recognition. I ask my readers to write a comment or send me an email with their thought on whether or not the Beer Science Literature Review is a worthwhile project or not. Do you think doing these mini reviews would benefit the brewing community? Do you have suggestions or some topics that perhaps I could find some literature on? Please let me know. Personally I really enjoyed working on this post. I feel like it was really beneficial for me and expanded my knowledge and, hopefully, it did for you as well.